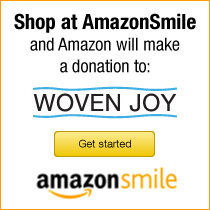 Woven Joy is a faith-based non-profit organization which focuses on sustainable livelihood. Woven Joy serves artisans in the Philippines through the buying, selling and distributing of their woven products. Each product sold helps provide for some of the basic needs of our artisans and their families such as food, shelter, clothing, medicine and education. Our artisans are also given the opportunity to gain skills in business, money management, leadership, product design and quality control. Woven Joy helps provide a culturally appropriate way for individuals to work and to help provide livelihood for themselves and their families through the buying and selling of creative goods. How does Woven Joy operate? Woven Joy works with two artisan groups from the Philippines. Each individual artisan operates as his or her own small business making and producing product from their own homes. Each artisan group is self-govering and gathers weekly for meetings and other activities. In the USA. Woven Joy operates as a buyer and distributor of the product that is produced in the Philippines through retail, wholesale and fundraising events. This product is sold online through its website and at select events and gatherings. All website e-comerce sales are safely and securely handled through PayPal. 100% of all profit is re-invested back into the organization. What is Woven Joy's Organizational Structure? Woven Joy is operated by volunteers and is overseen by a board of directors. Nonprofit 501c(3) status was granted by the US federal government in June of 2012.